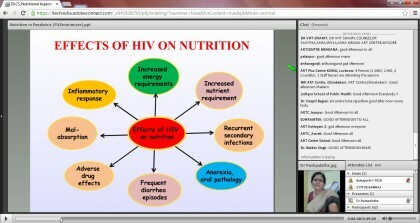 I-TECH India set a new attendance record for its twice-monthly online learning series on HIV/AIDS. The “Nutritional Aspects in HIV infected Children” lecture—part of the National Distance Learning Seminar Series (NDLS)—was attended by 342 participants from across the country, including all 10 Centres of Excellence (CoEs ) and 71 ART Centres. The lecture was presented by Dr. Pushphalatha, Professor of Pediatrics, Bowring CoE Bangalore. The last record was 285 participants for Dr. Rewari’s sessio n on National ART Guidelines in 2012. The series is aimed at health care workers and physicians working with HIV/AIDS patients. National experts present on variety of advanced care, comprehensive management, and treatment topics via live webcast sessions across several states and districts around the country. The goal is to create a dialogue amongst clinicians in regard to management of moderately complex cases. These 60-minute sessions are conducted in English and use a case-based format during the live session and allows participants to engage in follow-up communication across the sites. I-TECH launched the Global Health Clinical Seminar Series (CSS) in July 2007. With the goal of improving the quality of HIV care delivered by health care workers in resource-limited settings, the series brought together expert clinicians and health care workers in a web-based, interactive format from around the world. India was the first country in the I-TECH network to use this model to design and implement their own series in 2010. To support country programs in the global network, I-TECH developed The Global Health Webinar Series Program Package as a resource for organizations interested in creating a successful global health webinar series. Drawing from the experience of I-TECH’s Global Health Clinical Seminar Series (CSS), this program package offers critical tools for the planning, implementation, and evaluation of a webinar series in a variety of settings. The package also offers lessons learned and best practices by I-TECH’s CSS in the four years it was running.